The time to renew is here. 15 year of experience and passion for the technology and innovation area. Leadership and team work, analyst, focus and dedication ability to achive the best results based on the increasement and constant objectives improvement. 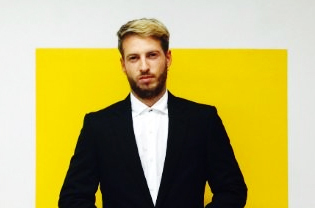 Creative and entrepreneur, autodidact with a high level of multi-disciplinary learning and adaptability. Ready to take new responsibilities. My responsibilities are focus in the technical leadership of team works, development of technology architectures and lead the design of digital solutions. Between the functions included the establishment of performance constant improvement on differences platforms and cost reduction. Brain UP Grup es a communications agency in Barcelona, i have been incorporated to the mobile development team to leadership the full refactoring the project Buugit!!. In order to this, we developed a new architecture based on hybrid solutions and supported from the Google Firebase infrastructure. 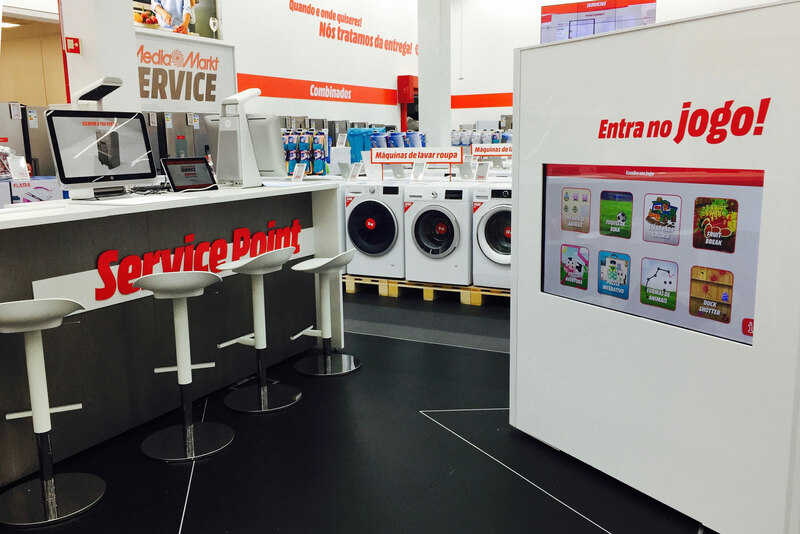 • Responsable of the developments and IT architectures to the innovation project GREENFIELD, building a new Omnichannel Business Concept strategy, leadering the new communications channels in Media Markt stores through Digital Touch Points. 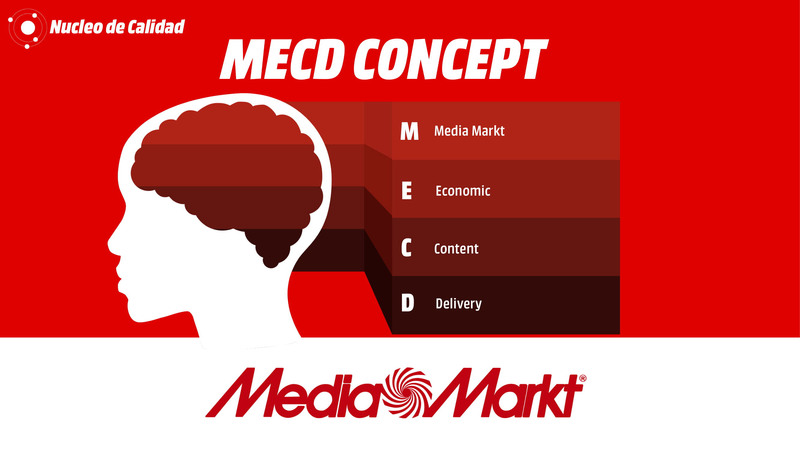 • Developments of functionalities implementations to mediamarkt.es E-Commerce. GrowLandia.com was a Spanish business specialized in the divulgation and study of cannabis culture rated as one of the leader in the area, with presence in all Spanish speakers countries, more than 400.000 followers in social networks and 14.000 daily subscriptors, generating stats above 2.500.000 montly views since 2011. Personal brand that guarantee 9 year of experience working as a freelance, developing more than 50 digital projects too national business. Nextt.es has more than 15 years of experience developing applications to the hostelry area, my incorporation to the team was to work from creative aspect the visual renovations of multiples products that company had on the market, achieving enhance the clients engagements and improvements all visual aspect to minimal interfaces. 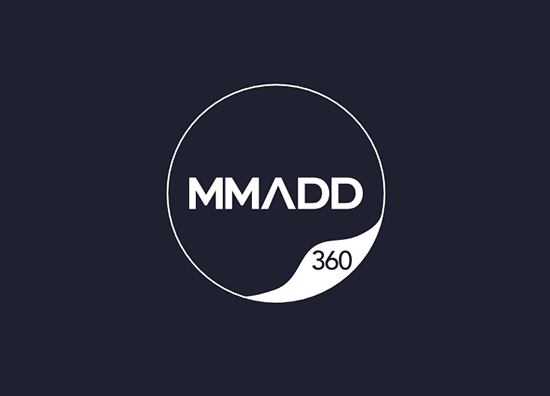 Clothes brand with a personal philosophy, created to transmit the art unification, the music and the extreme sports. Two catalog of clothes, one collection, five local sportsmans and a elite sportman sponsored, multiples investors and a group of friends decided to work to build an idea that taught us how to create our own business. 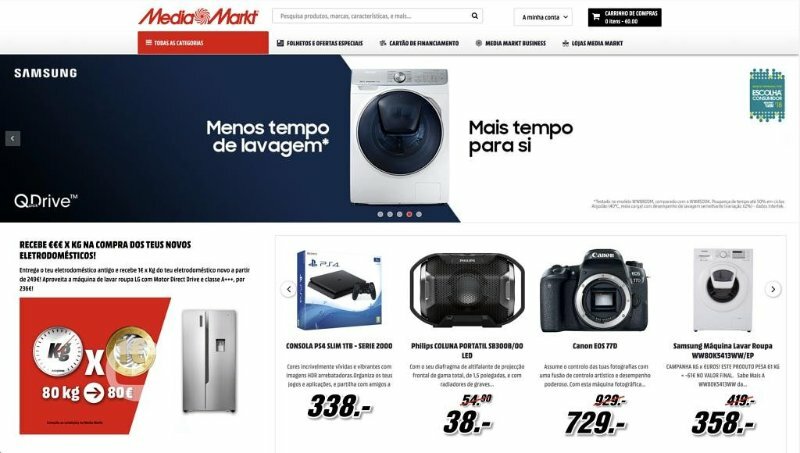 Platform migration project of Media Markt Portugal E-Commerce with the main objective of maintenance cost reduction. Analyzed, developed and executed with a time to market of two months. In order to do this, we choose to migrate all the portal and build it from zero, based in a Shopify infrastructure. The result was an increase in sells of the 50% in the first month and a maintenance cost reduction in a 2900%. MECD concept is developed as an alternative of solutions like Cloudfront or other CDN servers. With this project we achieved to implement a system with the similar needs but with a cost reduction of 95%. 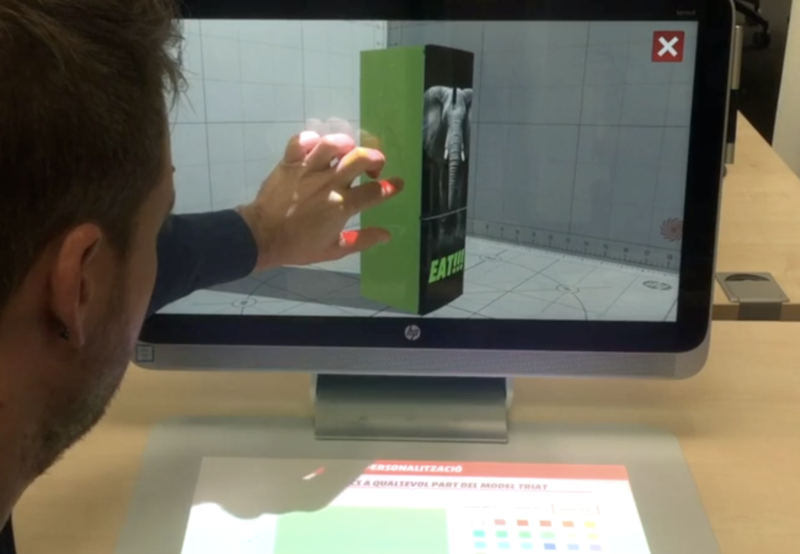 With HP, we created a interactive tool to the customers, that they can use to customize their products and preview the 3D result before the impression. 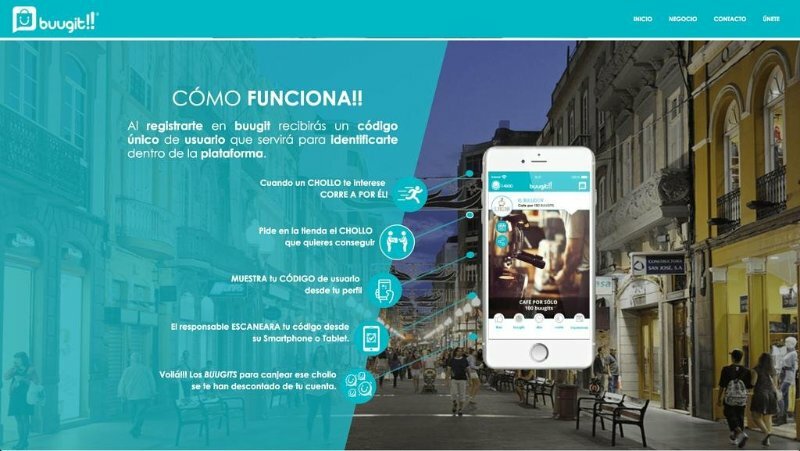 Mobile application with its own virtual coin, which enables to the users give “buugtis” and exchange them for offers and discounts in products on local shops. Full back office developed from zero to be able to manage and configure the multiples Visual Endpoints and Touch Points in Media Markt Stores. 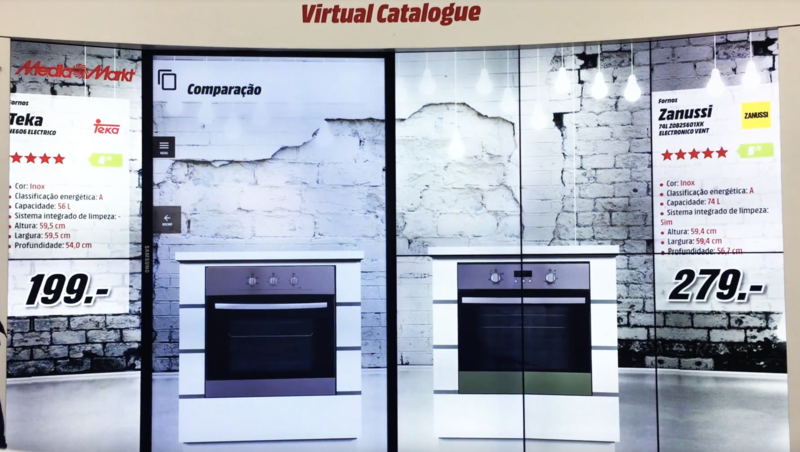 Digital touch point of big format to do a full virtual showroom of all home appliances products to real size, synchronized in real time with the online channels. Multimedia channel with differents types of contents, managed from automatic AI that create the reproduction of the cycles independently in every single channel. This screens are in the Media Markt stores with a 3x1,5m size. Multiples games multitouchs showed in a Totem as an experience zone for the customers in the store. 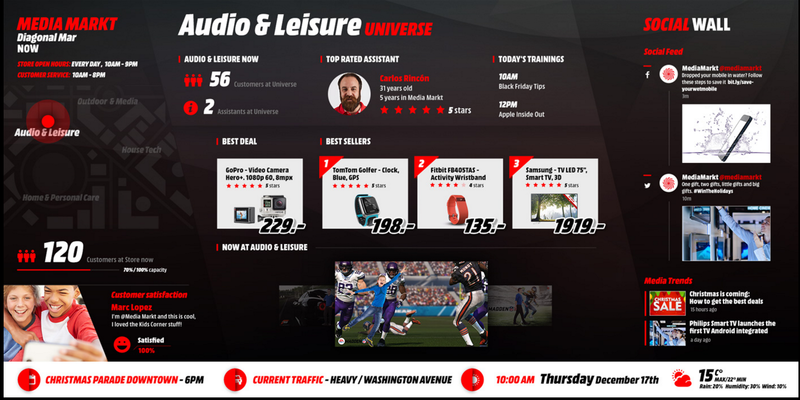 The mediamarkt.es platform has a customize design to show the prices of the products that depended on PNG images, generated from an script, this system has important limitations of size and quality. To accomplish with the quality standarts of the new web applications is need to build the prices without size limitations and high quality. 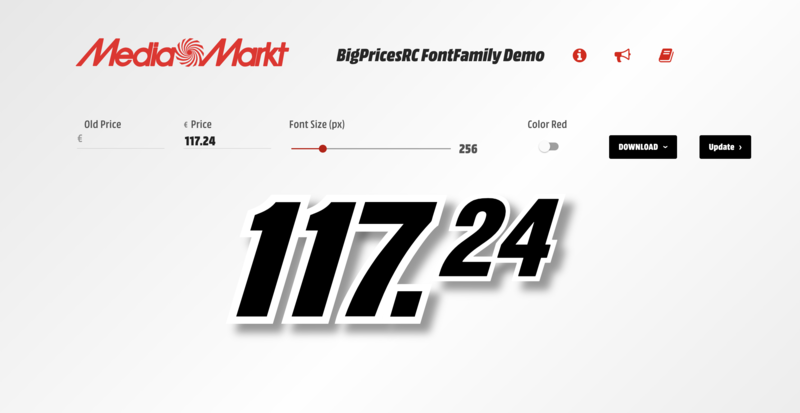 The MM BigPricesRC FontFamily prices give a flexibility that the images would never provide. You will be able to change the color and size, or put any other CSS effect. MM BigPricesRC has been implanted in the whole Media Markt platforms in Spain and Europe. As a solutions it was also developed a platform with Angular technology to show the project and to offer differents tools.